Who is the Organic Nanny? She sounds like someone I would trust my kids with in a heartbeat. Turns out the Organic Nanny is Barbara Rodriquez. She’s not only an organic nanny, but she is a nanny to celebrity families. 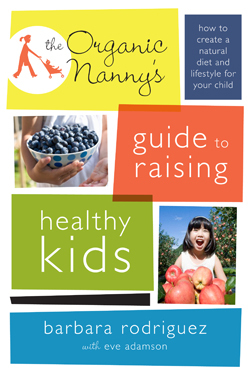 The Organic Nanny’s Guide to Raising Healthy Kids: How to Create a Natural Diet and Lifestyle for Your Child promotes diet and lifestyle changes to correct illness and behavior issues. If you want your kids to live a healthier lifestyle, but aren’t sure where to start—or are convinced they won’t ever touch a vegetable—the Organic Nanny is here to help. Rid your home of toxic products and much more! Some of you might not like the Organic Nanny’s advice. Step four is to “Ditch Dairy and Change Your Life”. I agree that cow milk is not ideal for humans. We only have it in our home occasionally. It seems to be something parents think they must feed their children. “Drink your glass of milk”. When I was a child, a glass of milk came with every dinner. Cow milk is designed for cows. I love my dairy, but not my milk. We eat cheese and yogurt. The Organic Nanny advises everyone becomes a vegan. I agree 100% with the rest of the Organic Nanny’s advice, I’m just not ready to give up my cheese. It’s more of a personal choice based on desire rather than health. If I felt like my family was having problems as a result, I would not hesitate to be a vegan again. « Organic Nursery: Live Good Baby Pillows are the BEST! I am on same page. We rarely have cow’s milk, but yogurt and cheese are in the house pretty much always. Although I think limiting dairy has a plus side, yogurt has benefits too, and the only way I can get my kids to eat enough calories is through having some animal protein in their diet. Even Shazzie, who is a raw vegan herself, has stated that based on her extensive research, children NEED to have a bit of animal protein for proper brain development (her book is called Evie’s Kitchen). I think she is right. An egg a week, or a slice of cheese may be all it takes, but the simple fact remains that we are not naturally vegans and forcing that lifestyle on our growing children may do a lot more harm than good. I was a vegan when I became pregnant with my first child. My body needed more. It craved the dairy. It’s when I started eating dairy products again. You worry about how what your kids are eating may affect their health long-term. Irradiated foods; genetically altered foods; foods loaded with preservatives, artificial flavors, and colors; produce treated with pesticides and herbicides; meat from animals that have been given growth hormones, antibiotics, and other chemicals; etc. The science of food processing is proceeding more rapidly than is the science of the risks and benefits associated with food processing. However, organic foods can be difficult to obtain in some communities. In most communities, organic foods are more expensive than their non-organic counter-parts. Still, families are turning, more and more, to organic foods. Families have learned that going organic doesn’t have to mean entirely revamping the way you cook. It can mean shopping more selectively and refocusing some of your family’s food choices. What follows are some easy, healthy, organic snacks for your kids that nannies have used. Buy organic cantaloupe. Slice into wedges. Remove rind and seeds. Wrap individually in wax paper. Freeze. Serve wedges like popsicles. Buy organic bananas. Peel. Insert popsicle sticks. Wrap individually in wax paper. Freeze. Serve like popsicles. Buy organic granola bars. Serve like candy bars. Buy organic trail mixes. Serve like snack cereal.